1. MEET JOHN WILLIAMS FOLDABLE: Students’ record facts they have learned about the music of John Williams. ♫ Instructions on how to assemble the foldable is also included! ♫ Excellent addition to your Composer of the Month! 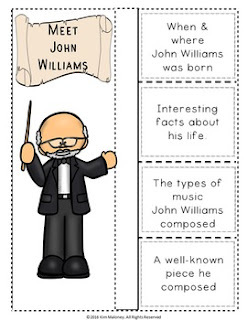 ♫Completed foldables can be pasted into student workbooks/listening journals OR displayed on a bulletin board. • Look for the green star next to my store logo and click it to become a follower. That’s all you need to do!